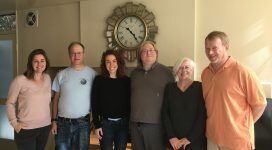 City Blossoms is a grassroots nonprofit that was founded to make safe, healthy, green space accessible to all Washington, DC residents, regardless of income. Today, City Blossoms builds school gardens and community green space nationwide. Our mission is to develop and implement innovative programming and tools that build healthy neighborhoods and schools through creative, kid-driven green spaces. In 2017, we provided over 2,200 hours of free and affordable interactive activities, access for over 13,000 children and youth citywide, and community engagement for over 1,500 volunteers and neighbors. Our primary focus is serving low-income communities and Latino, African-American, and immigrant children and youth. 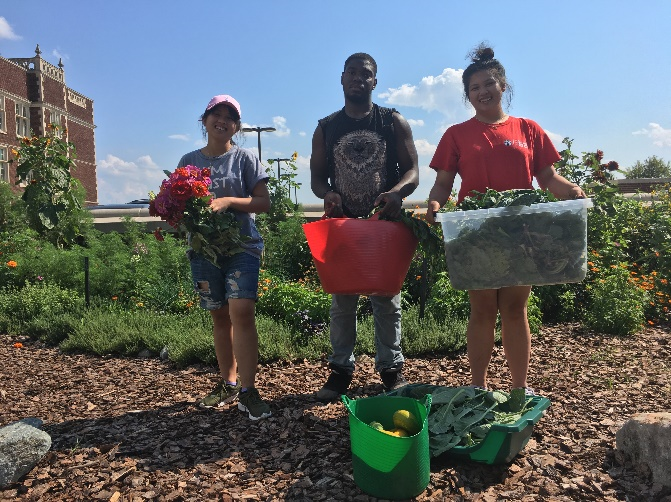 City Blossoms’ Youth Entrepreneurship Cooperative (YEC) is an innovative, garden-based, program primarily working with underserved high school students. It promotes academic, environmental, nutritional, entrepreneurial, and personal skill development. The purpose of this program is to address youth unemployment and create opportunities for youth to be stewards of their local environment and communities. YEC is a year-round program in which students participate in their own garden-based cooperative business. This model gives youth creative freedom and autonomy. YEC students are involved with every aspect of the design and implementation of their business, which they have named Mighty Greens. YEC students learn various methods of promoting and selling their seedlings, fresh produce, and added-value products, such as herbal soaps, balms, and bath salts, all of which are produced with harvest from their gardens. In 2017, YEC students made over $10,000 which was distributed based on the amount of time each student worked. Through this process, students learn financial literacy, cooking skills, and business know-how but more importantly, this program emphasizes social and emotional learning. The YEC program is the epitome of the beneficiary-led model. 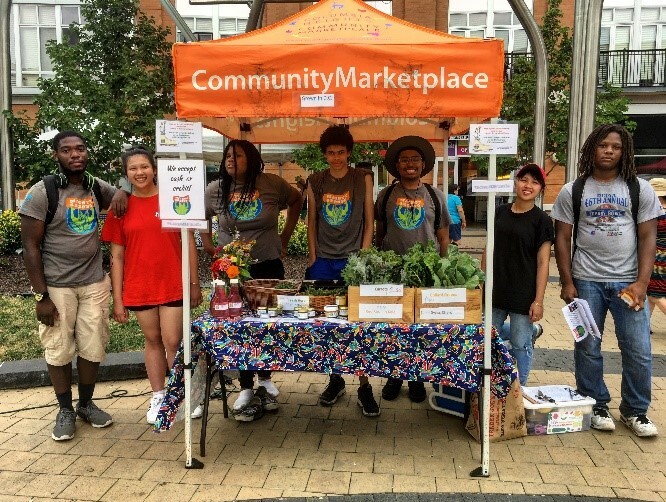 Youth Entrepreneurship Cooperative students sell their garden-based products, including balms, herbal soaps, and fresh harvest at a local farmers market. 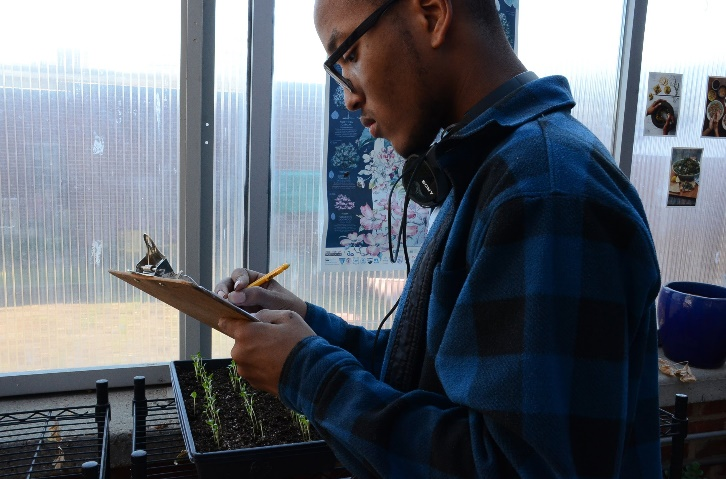 Youth Entrepreneurship Cooperative student studies the growth of his seedlings in the Eastern Senior High School greenhouse. Youth Entrepreneurship Cooperative students collect harvest from their garden. These images are courtesy of City Blossoms. Used with permission.